Taking it to the Sweet: Cupcake Street Art Takes Over the World! When we recently did a cupcake street art installation in Seattle, we had no idea that it would garner such a reaction--we've gotten so much love and support, and the project was even featured on KCRW's Good Food! Since then, we've received numerous emails from artists, crafters and bakers interested in spreading the sweetness in their own cities. We love this idea. 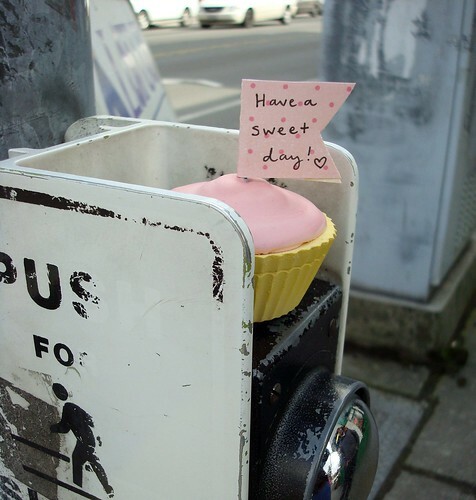 Spread sweetness throughout your neighborhood or city by making up a batch of sweet (but not delicious) cakes--here's a tutorial on how we made ours--and leave them in unexpected spots for others to discover, with the idea that this will brighten people's day. Help us document the project! Most importantly, take pictures! Send them--and your stories--to jessieoleson@gmail.com and we'll write about your experiences! Spread the word! Put the CakeSpy URL (or your own, if applicable) on the back of the little affixed flags, so that people can read about the project if they are the lucky ones who find the cakes out on the street.